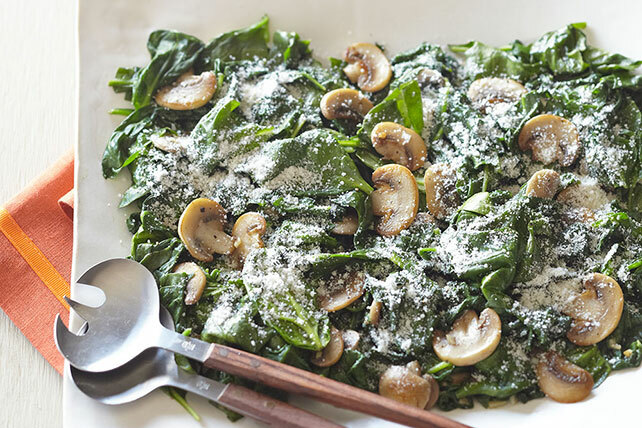 Win over even the non-veggie lovers in the house with the rich flavors of garlic and Parmesan in our Sautéed Spinach with Mushrooms. Heat oil in large skillet on medium-high heat. Add mushrooms and garlic; cook and stir 3 to 5 min. or until mushrooms are tender. Add spinach; cook and stir on medium heat 4 to 5 min. or just until spinach is wilted. Stir in pepper; sprinkle with cheese. Spinach can be added in batches if your skillet does not accommodate all of the spinach at once. As soon as the spinach begins to wilt, add the remaining spinach. Substitute 4 pkg. (10 oz. each) frozen spinach leaves, thawed and drained, for the fresh spinach. Cook mushrooms and garlic as directed. Add spinach; cook until heated through, stirring frequently. Continue as directed.